We slept hard again last night and didn’t want to wake up this am. “Ok” said Laurie with a smile, her eyes still closed as she turned to her right side. At 5:45 Andy turned the valve on his air pad and let out all the air. He slowly started to pack while Laurie kept sleeping. This morning was at least 5 to 7 degrees warmer than yesterday, but Andy still put on his fleece. Around 6:15 Andy was done packing and Laurie still hadn’t gotten out of her sleeping bag. She was cozy and warm and couldn’t bring herself to open her eyes. We are definitely tired and even short hiking days and more sleep aren’t enough to overcome the fatigue. Laurie finally willed herself to get up and get packing. We were on the trail by 6:45. 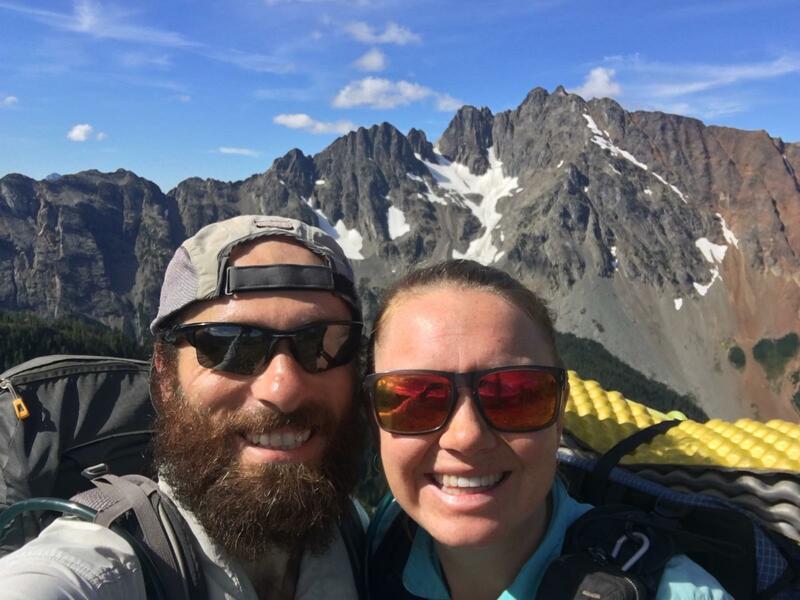 As we walked Laurie expressed her disappointment with stopping early yesterday instead of pushing on to Glacier Pass and having a campsite with pretty views. 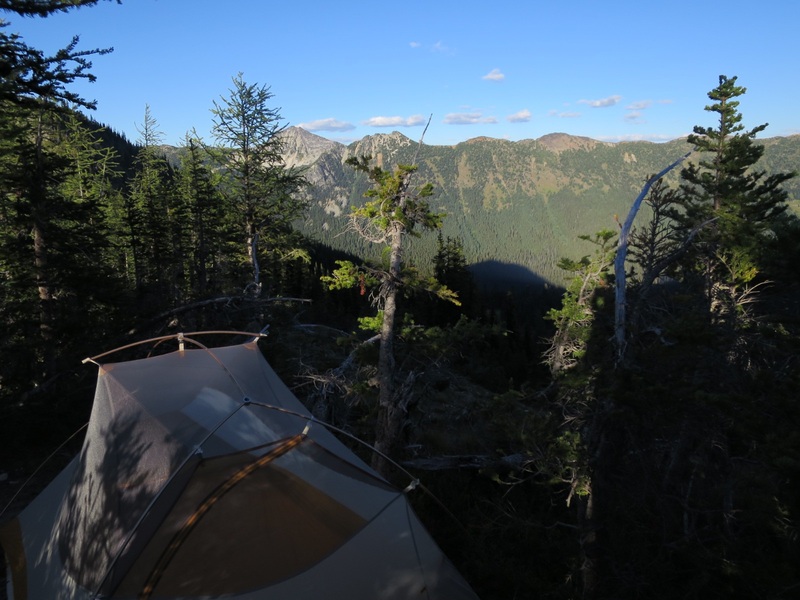 To Laurie, slowing down to enjoy our last days in Washington means we should camp in scenic spots with grand views. Andy wants that too but he also wants to enjoy the views along the way to camp. We took many breaks yesterday, some longer than others, and enjoyed the day. But Laurie was disappointed with our camp spot knowing what potentially lay 5.5 miles ahead. All morning she kept thinking about how we had missed out on the views, the beautiful sunrise with the alpenglow on the jagged mountains. 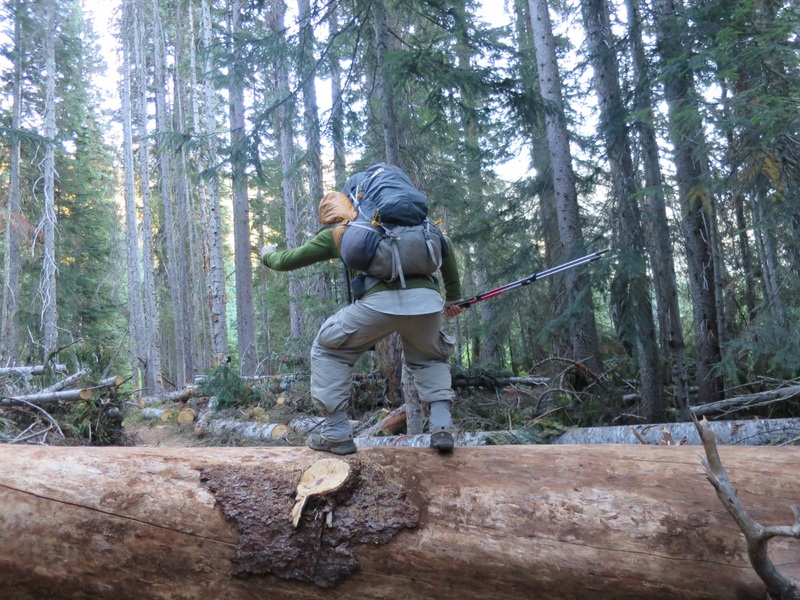 She wants Andy to push her to hike longer days to get to pretty campsites. And he has. But he didn’t yesterday. He loved how yesterday unfolded and was perfectly content with their camp spot near the river. Laurie has been a ‘go, go, go’ type of person most of her life and has a hard time being content with where she is. The present is never good enough. Our attention for the first 5.5 miles was inside our respective heads. How can we find a balance between our different personalities and mentalities? How can we as a couple make eachother better? As we neared Glacier Pass we turned the corner and Andy shouted ‘hello’ to someone. It was Sam! We thought he’d be miles ahead as he wants to be done tomorrow. But there he was, still in his tent reading his book. He was camped at Glacier Pass, the very spot we wanted to push to last night. The campsite was in the trees and it was cold. But most notably, there were no views to be had. Andy’s app was wrong. 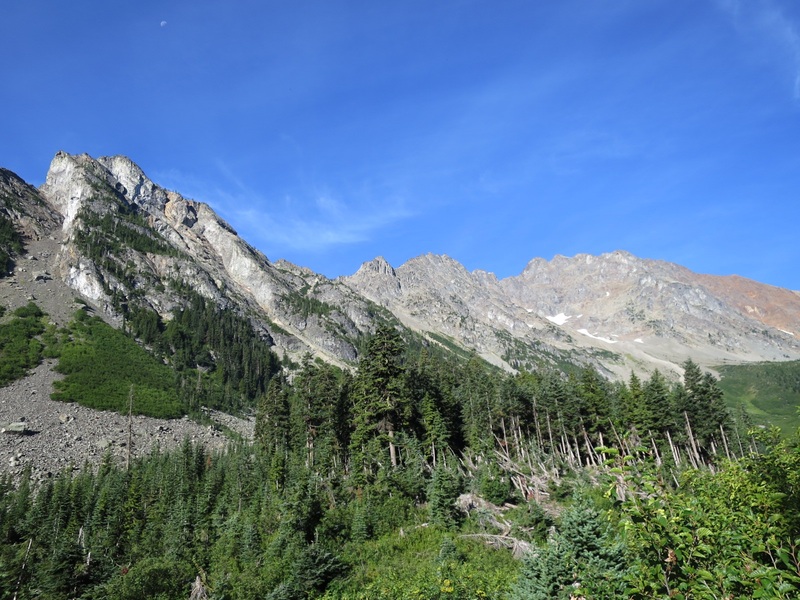 The pictures of the incredible views were from campsites 3 miles ahead, not Glacier Pass. So after all that, even if we had pushed and hiked 28+ miles last night, we wouldn’t have had the evening or morning views we had hoped for. We hiked on, with Laurie now beating herself up for creating big expectations and being upset when things don’t turn out the way she wants them to. We switchbacked up to a ridge. Now this would have been the place to camp! A sheer rock wall lay to our south with mountains on either side. If we ever come back to this area Laurie vowed to camp up here to watch the sunrise and morning alpine glow. We took a break staring at the incredible view. Far below us was a valley with 3 turquoise ponds. Little patches of snow remained on some of the slopes. The sun felt good against the slight chill in the air. Laurie took a 30 minute nap, using her food bag as her pillow and hiding in the shade of Andy’s body. 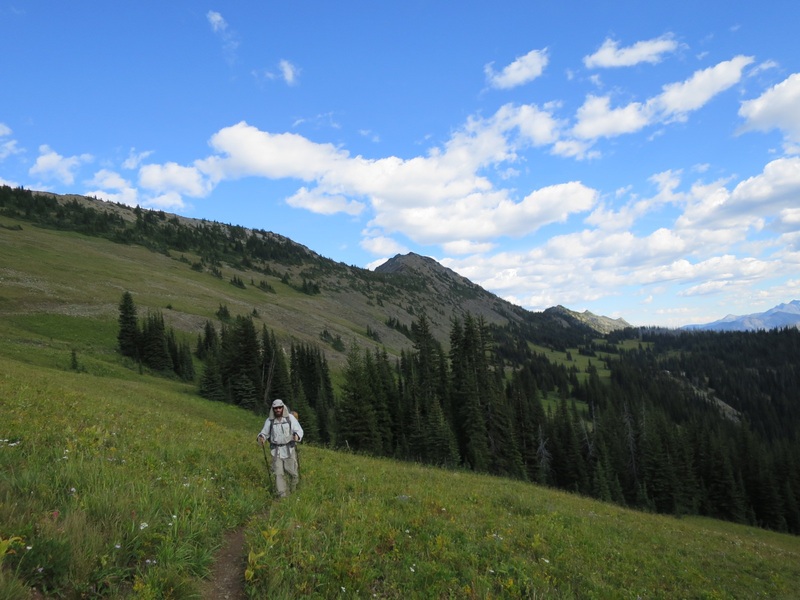 Once moving again we traversed scree slopes and dropped down towards Harts Pass, the last road before Canada. The last 2 miles to Harts Pass felt never ending. The trail twisted and turned every which way until we finally popped out on a dirt road and walked 100 feet to an intersection of 3 dirt roads. As we descended we could hear dirt bikes rumbling in the distance. Once at Hart Pass there was much more traffic than we expected. We sat on a log in the shade and ate some snacks. Sam joined us for a few minutes before he continued on. As we were preparing to leave a man stopped his car and offered us an OR sun hat just like the ones we wear. He said he had found it while cleaning up around a lake and had no use for it. Laurie’s hat was on its final leg, it had been sewed many times and was currently being held together with dental floss. We graciously accepted the hat as well as a beer for Andy. 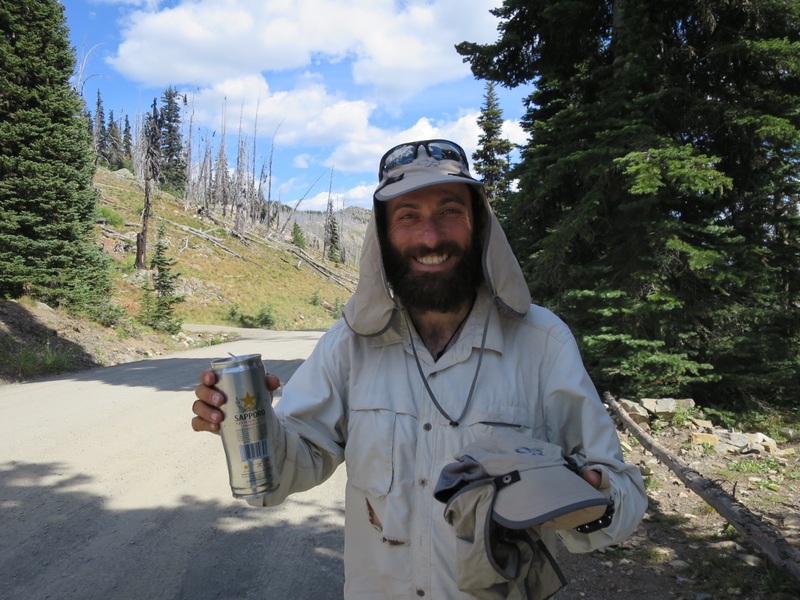 Before we got to Harts Pass Sam mentioned that he hoped for trail magic one last time. If only he had hung around for another few minutes he would have gotten it. 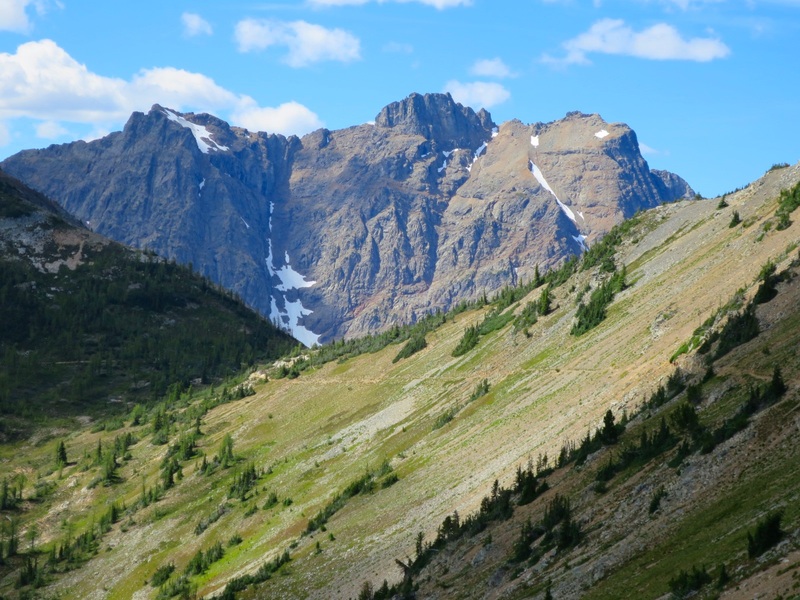 We left Harts Pass and gradually walked up to Buffalo Pass and eventually down to Windy Pass. The grade was so gentle it felt like we were walking on a level road. We sauntered through green meadows with the last of the wildflowers. Lately, and particularly in Washington, many of the passes are low spots. This is counterintuitive for us. 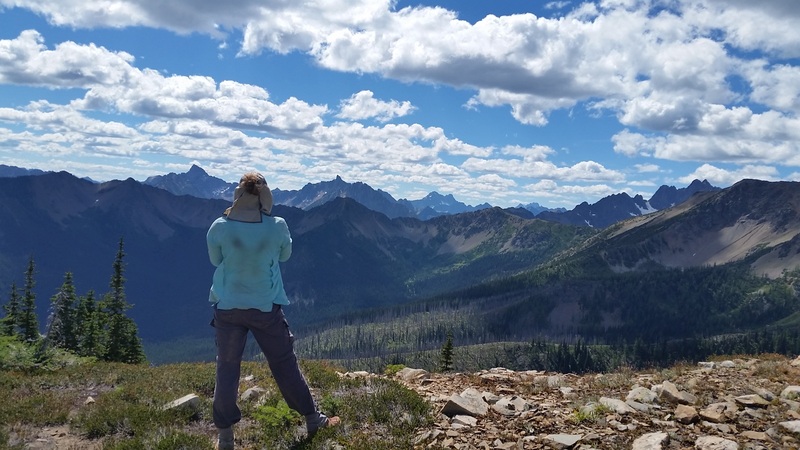 We think a pass equates to a high point and views. Not always the case. We got to our planned campsite around 6 pm to find 3 parties already set up. We looked for another spot but didn’t find anything appealing. We decided to push on, hoping for something higher up and with a view. At the top of the ridge right before Foggy Pass we found a little semi-flat area nestled between trees and protected from the sun. We set up the tent, placing extra clothes under specific parts our sleeping pads to create level ground. 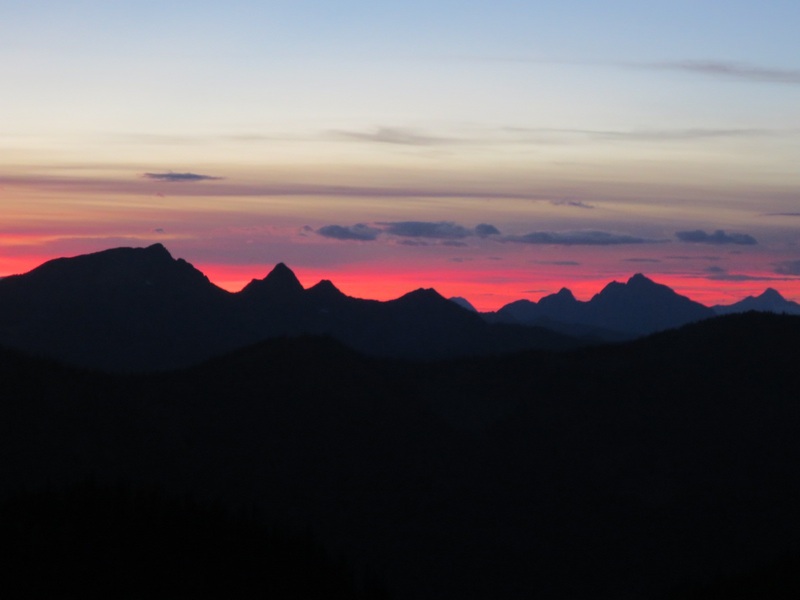 We watched the sunset and the colors change from the comfort of our sleeping bags and tent. What a show! It was tremendous. Light orange sky turning pink and red with clouds joining in on the party. Today was a hard communication day for us. We had more little struggles and misunderstandings than normal. Neither of us are sure what caused this but it could be that we are nearing the end and the stresses of city life are creeping back into our daily thoughts. At least for Laurie this is the case. Andy doesn’t stress. He believes everything will work out. 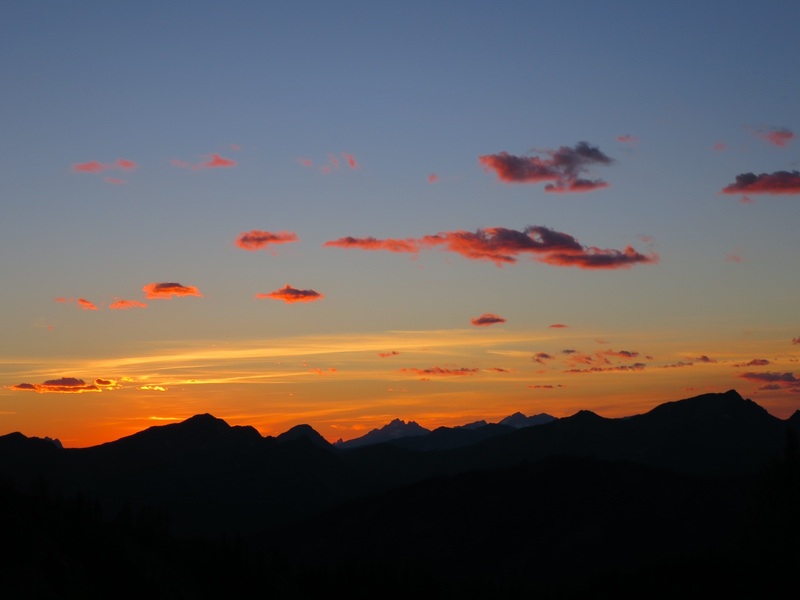 Tonight we are grateful for flat spots on ridges and blue skies in Washington. Thanks Tailgater. Too bad we never got to meet on the trail. 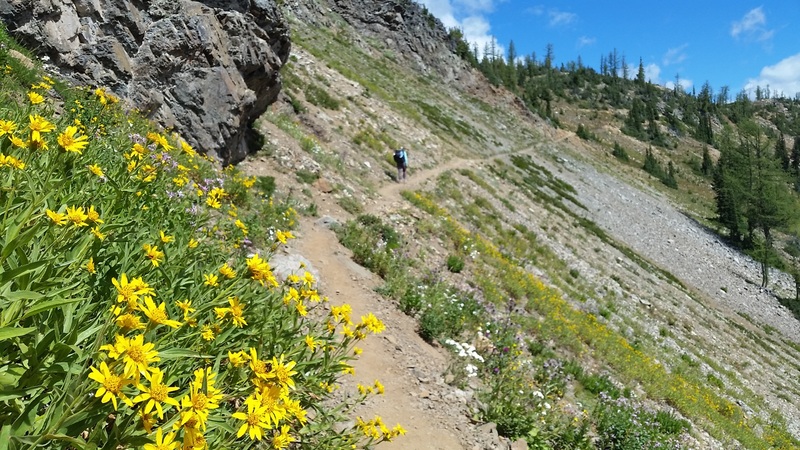 We hope those 150 miles were awesome and that someday you are able to continue to work your way north-this trail is magical. PS That is an amazing trailname! We try very hard to fill the needs of each life, and to understand that it is ok to have some elements that are just our own. Having kids throws a whole new personality into the mix and it does very much change how you live ( there’s no going back…) but life can be greatly enriched. I really enjoy our little bushwalks and geocaching trips, and trips to zoos and Aquariums and other little adventures. We get to build a human being! We’ve never created anything before but we can do this! Anyhow, enjoy your last few days on this trail!